William Henry Fox Talbot took the first flash photograph in 1851. In a darkened room, he attached a newspaper article to a spinning wheel, and exposed his film with a single flash of light. In the resulting image, he was able to see the text of the newspaper clearly. Because he used the spark from charged Leyden jars, this flash method was only suitable for use in a lab. Battery powered lights and magnesium flash powder were also used for indoor photographs in the 19th century. However, both of these techniques had shortcomings; the battery powered lights were not bright enough, and magnesium powders were dangerous due to risk of explosion, smoke, and poisonous fumes. Despite the dangers, flash powder continued to be widely used into the 20th century. By 1930, one-time use glass bulbs were being introduced. Although more expensive than flash powder, these bulbs could be used in conditions for which the flash powder was unsuitable (on windy days, inside a submarine, etc.). Edgerton is well known for his photos of splashes, bullets, and human motion. While he was not the first to take photos that freeze or illustrate motion, he improved the flash technology and used these subjects to popularize it. In the 1870's Eadweard Muybridge used a sequence of photographs to answer the debated question of whether or not all four of a horse's hooves leave the ground at once. As the horse ran, it broke a series of wires stretched across the track. Each thread triggered the shutter of a camera, and Muybridge photographed the sequence of events. In the following years, he used this technique to study the motion of humans and animals. In 1882 Etienne-Jules Marey designed a photographic gun to be used for chronophotography, a series of images taken at set time intervals. The gun contained a rotating wheel with slits. When light passed through one of the slits, that portion of the photographic plate was exposed. While initially intended for scientific research, Marey's work (like Edgerton's after him) had an aesthetic quality. 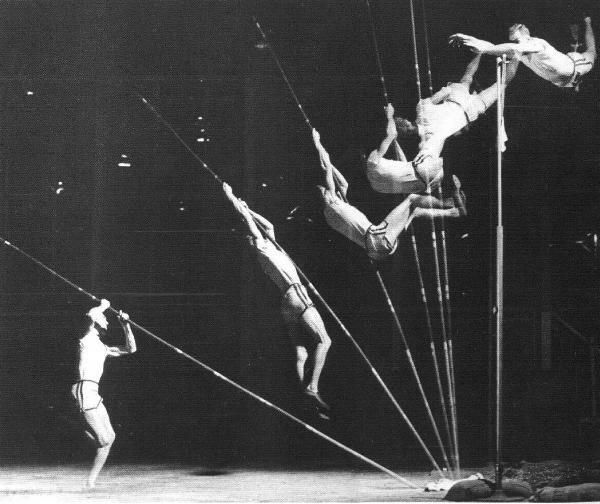 Below are two images of pole vaulters. On the left is Marey's photograph1, using the photographic gun. On the right is Edgerton's version2, taken using his electronic flash. Both Muybridge and Marey used natural light and mechanical devices in their motion photographs, and therefore, were not able to achieve the same speed or level of detail as Edgerton's work. Another scientist, A.M. Worthington, used an open air spark generator to obtain the photos in his 1908 A Study of Splashes. This technique required darkness to take the photos, but he commented that he would like to be able to take the photos in daylight. Edgerton's stroboscope would later make this possible. Aerial photographs were used for reconnaissance during World War I. After the war, development of cameras for aerial photography continued. In 1928, the Royal Air Force was using an aerial camera that could photograph an area of 4 square miles from 30,000 ft -- beyond the reach of anti-aircraft guns. This camera contained an electrical heating system to prevent the shutter from freezing at high altitudes. Some aerial cameras intended for land surveying had a slit instead of a shutter. The speed at which film was fed through the camera was synchronized with the plane's speed, so a continuous image of the terrain could be obtained. In the United States, George Goddard was a major influence in the advancement of aerial photography. He took the first night aerial photograph in the U.S. in 1925. To illuminate the ground below, he released a bomb of magnesium powder from the airplane and triggered the camera shutter to coincide with the flash. While use of flash powder made night aerial photographs possible, it was not an ideal solution. The flash powder was dangerous due to the risk of explosion in the plane. In addition, the number of photographs that could be taken was limited by the amount of powder carried on the plane. 1 Jussim, Estelle, Gus Kayafas (Editor), Harold Edgerton. Stopping Time: The Photographs of Harold Edgerton, Harry N. Abrams, Inc.: New York, 1987, p. 26. 2 Edgerton, Harold E. and James R. Killian, Jr. Moments Of Vision: The Stroboscopic Revolution in Photography MIT Press: Cambridge, 1979, p. 84.